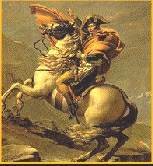 Napoleon Bonaparte was one of the greatest conquerors and finest generals that France and even the world has ever known. He began his career as an artillery officer and in 1793 he defeated the British fleet in Toulon. Thereafter he was promoted from commander of artillery to Brigadier - General. In October 1795, he was in command of the Paris troops who were defending the National Convention against the mob. In 1796, Bonaparte led the French army in Italy, against Austria and Sardinia. He defeated Sardinia and ultimately the Austrians too. In October 1798, he was appointed as the General of the Army to invade England. However the British armed forces, under Admiral Nelson miserably defeated the French fleet and locked them up. Napoleon returned to France in 1799 and overthrew the Directory in November 1799. He introduced government by three Consuls namely Napoleon Bonaparte, Abbe Sieyes and Roger Ducos. Thus he became the first consul and enjoyed dictatorial powers. In 1802 Napoleon became Consul for life by popular vote, and in 1804 he became emperor by another popular vote. He was defeated by the British in 1805. He defeated Austria and Russia in the Battle of Austerlitz, in December 1805, Prussia in the Battle of Jena in 1806, and Russia in the Battle of Friedland in 1807. After defeating Austria, Russia, Prussia, Napoleon’s attention was fixed on England. He tried to prevent the import of English goods into Europe, but failed. Since Russia imported English goods, he attacked Russia in 1812. However, he suffered a major defeat with the Russians following the policy of retreat. In October 1813, Napoleon’s army was defeated in the Battle of Leipzig. In 1814, he was completely defeated, captured and exiled to Elba, a small island in the Mediterranean. In March 1815, Napoleon escaped from Elba, returned to France and ruled for 100 days. However, he was finally defeated at the Battle of Waterloo on June 18, 1815 and exiled to St. Helena, where he died in 1821. Napoleon was not only an excellent general, but also a great administrator and statesman. He centralized the whole of the administration of France. The local government was made subordinate to the central government. There was to be a Prefect as head of a department; a sub-prefect as head of an arrondissement and a mayor for each town. They were to be appointed by and responsible to Napoleon. Napoleon improved the financial position of his country by a careful collection of the taxes and a rigid economy. The Bank of France was established in 1800. Bonaparte introduced many educational reforms. Primary, elementary and secondary schools were established in rural and urban areas. The government directly regulated schools for higher and technical education, civil services and military schools. The University of France was also established. Napoleon carried out several public works. He constructed new broad military roads, bridges, canals, waterways and seaports for commercial and naval purposes. He was able to solve the difficult problem of religion in the state. He negotiated with Pope Pius VII. Finally, a Concordat was concluded in 1802. It governed relations between the Church and the State in France for 103 years. This guaranteed freedom of worship to all. He appointed several committees of legal experts to draft in simple, clear and concise language, five codes, namely: the civil code, the code of civil procedure, the code of Criminal procedure, the Penal code and the commercial code. Some of the outstanding features of the ‘Code Napoleon’ are personal liberty, social equality, religious toleration, emancipation of land, public trial, and the jury system. It presented to Europe, the fundamental rules governing civilized society. Napoleon Bonaparte thus stands out as one of the greatest generals and conquerors, a peerless administrator, a lawgiver, and the greatest diplomat the world has ever known. Napoleon appealed to the masses as a great orator. He abolished feudalism wherever he went and replaced old, outmoded, confusing and conflicting laws, with the new Code Napoleon. Professors Grant and Temperley rightly conclude, "Napoleon was without question a man of extraordinary force of brain and character. He had great powers of work and of organization, and the gift of genius which defies analysis."